Concerns regarding raw meat handling in the South Bay ramped up over the weekend after a woman shared a 2016 photo featuring meat sitting uncovered in a shopping cart being wheeled into a San Jose grocery store just days after another person shared photos capturing a similar scene at another store in the South Bay city. Thom Jensen reports. Concerns regarding raw meat handling in the South Bay ramped up over the weekend after a woman shared a 2016 photo featuring meat once again sitting uncovered in a shopping cart as it was being wheeled into a San Jose grocery store. The most recently shared photo comes days after another woman witnessed raw meat resting in Costco shopping carts being delivered to the 99 Ranch Market in North San Jose. 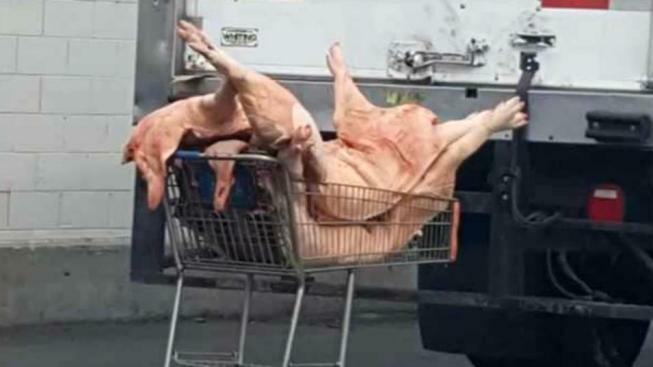 Back in March 2016, Christine Cabral spotted butchered hogs placed in shopping carts being rolled through a back door at Marina Grocery in San Jose. "I yelled," she said. "I rolled down the window and was like, 'Hey, that's disgusting.'" NBC Bay Area visited the grocery store in question and showed Cabral's photo to a man who one employee identified as a meat counter manager. The manager said he has not seen employees handling raw meat in such a way at the establishment before. NBC Bay Area also contacted a supervisor at Marina Grocery who then called her manager. The manager indicated that nobody would be able to comment on the matter at this time. A person who works in the meat cutting and packing industry but wished to have his identity concealed said he has also seen instances of raw meat open to the air being transported in shopping carts several times over the course of the past two years. "Anybody that works or is in that industry should know that that's a red flag," the person said. Cabral said she hasn't been able to return to Marina Grocery since coming across the unsanitary delivery." "Look at that," she said, referring to the snapshot she captured. "Can you imagine our kids touching that? Maybe people will listen and go get something done there because I'm pretty sure they're still doing it to this day." United States Department of Agriculture standards indicate that raw pork should be refrigerated right up to delivery and should not be left uncovered and open to contaminants.